Various thoughts and comments of the goings on of a palaeontologist/biologist going through his early career. Brought to you by Andrew Cuff, a postdoc at The Royal Veterinary College (previously UCL as well). All content is strictly the opinions of the author and in no way is associated with the universities to which he is affiliated. All muscles in vertebrate bodies are activated by electrical signals, usually from nerves. These activated muscles then contract resulting in some form of movement. The electrical signals that activate the muscles can be detected by sensitive equipment using a method known as electromyography - or EMG for short. A fancy version for just hearts is often used electrocardiogram (EKG/ECG). In humans these electrical signals can now be measured by attaching skin based electrodes, but when this technology was first being developed people would use wires attached to needles they would inject into the muscle. However, these methods don't tend to work easily for lots of animals: skin based electrodes need clean, moistened, thin skin; needles need animals obliging to leave them in place! As we have been working with crocodiles (thick skin with bony osteoderms within them), and birds (covered in feathers) and neither were tame, skin and temporary injected electrodes were not options. Therefore we had to carry out surgery to directly implant wires into the muscles, and connect them to a backpack on the back of the animal that could not be damaged by the animals. Now this might sound extreme, and invasive procedures are, but because of this all of our procedures passed through ethical approval from the universities, and the UK Home Office, with the goal of collecting the highest quality data, whilst maintaining animal welfare, and using the fewest animals. In all, the study covered work from DawnDinos with tinamou and crocodiles, as well as previous unpublished work on emu, quail, turkey, pheasant, and guinea fowl. Figure designed for the paper that never made it. Showing the direction of travel and what we mean by toe-on and toe-off. Figure 2. from Cuff et al., 2019. Representative EMG signals from emus of three ages. People have studied EMG in animals for a while, so why is our study interesting? 1) We provide the first data for the palaeognathous birds (the group which include ostrich, emu, tinamou, kiwi, cassowary and some extinct birds like moas and elephant birds). Whilst this may not sound particularly important, almost all of the published bird data to date comes from a small part of modern bird diversity, (mostly the group which include chickens, quail, guinea fowl) and as such it is vital to understand whether these few species are representative of birds and how much variation there is. From the overlapping datasets, it appears that birds are pretty consistent. Fig S8. from Cuff et al., 2019. This figure shows an averaged and rectified (all values made positive, as EMG signals are both positive and negative) signal for the lateral gastrocnemius (part of the calf muscle). Foot-on/stance starts at 0.0 on the X-axis, and ends at the vertical line somewhere between 0.4 and 0.7 when swing/foot-off starts. Hopefully, it can be seen that most birds have peaks both at the very beginning of stance (left most part of the graph), and then at the end of swing (right part of the graph). 2) We provide the first EMG data for crocodiles. Sadly we didn't get as much data as we would have liked to compare to the previously published Alligator data, but still obtained some nice data for the pectoralis, and several leg muscles. The most interesting of these is the m. transversus perinei (TP for short). The TP is an unusual small muscle the wraps around the largest leg/tail muscles in a crocodile, the caudofemoralis longus (see John's blog for a good article about it). Figure 1B from Cuff et al., 2019. The TP is the labelled brown muscle, that wraps around the caudofemoralis longus (the blue one). The caudofemoralis longus (CFL) is important for leg retraction (basically when the muscle contracts it pulls the leg backwards). The TP shows muscle activation similar to that of the CFL suggesting that when the CFL contracts, the TP contracts too. 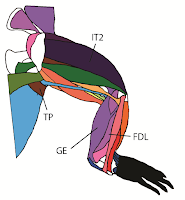 This suggests that the small TP may play a vital role in helping shape the CFL similarly to that of the caudofemoralis brevis and thus changing the moment arms of the muscle. We are hoping this might be confirmed by other researchers in the future. 3) We show how EMG signals change as emus grow. Well, they don't actually change that much, the overall signals are very similar, but as they get older, their signals get shorter suggesting that they've gained better control. This has been seen before in bird flapping, particularly for wing assisted incline running. 4) There is no difference in signals between crocodiles walking on treadmills and overground/in runways. This one may not seem that surprising, and matches with published data for birds previously, but always good to know especially as most experiments are done on treadmills to keep speeds consistent. Modified Figure 8 from Cuff et al., 2019 showing the similarities between treadmill (0.1ms-1), and runways/overground for the pectoralis and TP muscles. 5) All of the data from our study and previous published works was combined to give an evolutionary history of muscle activity. Figure 9 from Cuff et al., 2019. Archosauria and Aves are annotated with key ancestral EMG patterns for muscles focused on in this study; simplified into “Stance” (circle filled on right half) for mainly stance phase activity (potentially with some late swing phase), “Swing” (circle filled on left half) for mainly swing phase activity, and a “Stance” circle rotated 30 degrees anticlockwise for the more pronounced earlier swing phase activity (and earlier stance phase end of activity) evident in the GL of Aves. Additional EMG data for ducks (Biewener and Corning, 2001) and pigeons (Gatesy and Dial, 1993, 1996) further bolster the results here for Aves but for simplicity are not shown. That pretty much sums up the paper, there is obviously a lot more detail in there, and if you are interested and cannot access it from the link at top let me know and I can get you a copy. I am a postdoctoral researcher at the Royal Veterinary College working on the DawnDinos project. My work focuses primarily on the biomechanics of dinosaurs, but I have worked on felids, marine reptiles, pterosaurs, crocodiles and even fish. My blog is meant to be a way to communicate my interests in science, and my work to any interested people. I hope you enjoy and feel free to leave comments.